Even in BioShock Infinite's Alternate History, America Was a Woman. But Not a Nice One. We all know Uncle Sam. The guy in the Old Glory-styled top hat and tails is the personification of the United States that American schoolkids grow up learning about. You probably know him from the famous poster strongly urging that you enlist and maybe you've seen him done up as a superhero. But did you know that Uncle Sam has an older sister? And that she's where the floating city in BioShock Infinite gets its name from? As an article on The Atlantic pointed out yesterday, the personification of the U.S. used to be a woman named Columbia, one who predates Uncle Sam. But, where Sam's still a familiar icon, the idea of a distaff counterpart has faded from memory. The Atlantic article showed how she's been portrayed in political cartoons throughout the ages and included images where she's advocating for immigrants from Germany and China. But the version of Columbia seen so far in Irrational Games' upcoming first-person shooter appears to be the polar opposite. 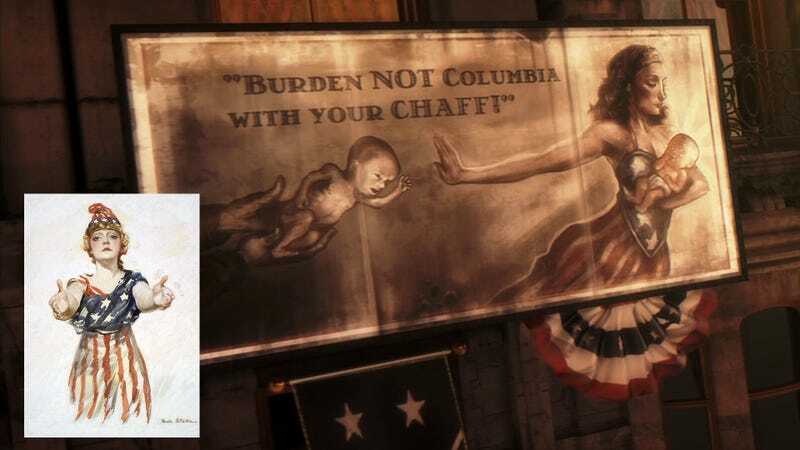 As she's portrayed in BioShock Infinite's promo art, Columbia isn't welcoming people in. No, she seems dead-set on keeping people out. In the image with George Washington, she hovers above the nation's first president as he stands fast against foreign hordes. And, yeah, it's worth noting that those caricatured foreign hordes include Native Americans. And, on a banner shown in an early peek at Infinite, Columbia rejects a baby held out on outstretched hands, while cradling another. That piece of artwork gives you pause with how mean its implied message is. But the whiplash it generates is more significant when you think about those cartoons with Columbia demanding a fair shake for everyone. It looks like BioShock Infinite will be focusing in on a warped, fanatic ideal of what it means to be American. And, from what we've seen at this point, the game's vision of Columbia—both city and persona—doesn't think everyone belongs in its society. This use of a mostly forgotten personification of America falls in line with the thought process behind making a robot George Washington one of the game's big enemies. It's a provocative practice in reality when radical factions twist symbols from American history to ugly ends. In real-world and game-related posters, Columbia calls fighting men to arms. Based on what Irrational co-founder Ken Levine has said about the game, you get the idea that the battles that follow are very different in what they're trying to achieve.